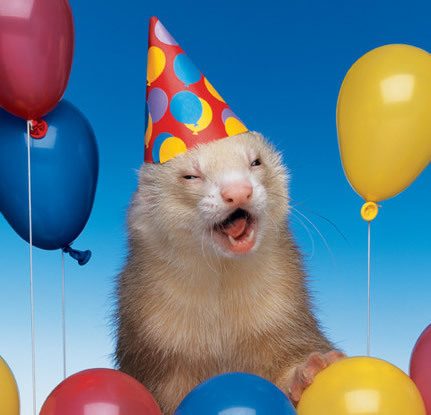 Everyone needs an inner Party Ferret. And they have high metabolisms. I know the title sounds like I’m procrastinating but I have the Dr’s permission to re-start my strict diet regimen, tomorrow. (Like, I ever stuck to anything strict except my teen-hood curfew, in my life.) I got weighed yesterday and was up 2 pounds. She even said that was only a tiny bit and wouldn’t tell me what she gained over Christmas. It’s all about the bacon, right? Well, because today is the New Year’s dinner, I can start tomorrow. I am not to go flagrantly overboard but subtlely overboard. This is the day when most diets and exercise plans are started due to New Year’s resolutions. I don’t make resolutions at New Year. I have enough left over from the rest of the year. I will restart my journal, tomorrow. I will stop eating the chocolates, tomorrow. I mean, really, I still have half a bag of candy cane Hershey’s Hugs. I will weigh myself, tomorrow, and make this my starting point for the weekly weigh. But..today I will go for a walk. It’s only 7 Celsius (44F) out there and the fog is lifting. But…we all have to be realistic. I know myself and making a resolution that is unrealistic is just a jumping off point for failure, then massive guilt. I do not want any new guilt puppies. So tonight I will make a ham, roasted potatoes, broccoli (yes, broccoli, even though I don’t like it, I will include the stems and a nice from-scratch cheese sauce), and brownies with raspberry sauce and whipped cream. You are all invited! ~ by 1fatgirlshrinking - Diane Kirby on January 1, 2014.